Ford provides more ways to set up the sports coupe than can be found in the menus of most digital racing games. In addition to the state-of-the-art digital instrumentation, drivers can adjust the engine note, tweak the ride and slip into dragster mode. The best way to spell user experience in a Mustang? F-U-N. In the past that’s meant a powerful engine for off-the-line jump, a blistering top speed and a baritone note sweet enough to make Placido Domingo weep. In more recent years, Ford has added slot-car-like handling to up the entertainment quotient, and for ’18 the sports coupe’s UX takes another exponential leap in excitement with a video-game-inspired redo of the cockpit. Even before sliding behind the wheel, the new Mustang, named a 2018 Wards 10 Best UX winner, delights the driver, with puddle lamps projecting its iconic galloping horses on the pavement below the doors. Inside is a smartly dressed interior featuring stitched leather seats and steering wheel, textured-metal trim along the dash and bright accents on buttons and dials. Fire up the ignition and the horses appear again, this time with the Mustangs speeding across the new 12.4-in. (31.5-cm) configurable liquid-crystal instrument cluster and center display screen. Ford provides more ways to set up the car than can be found in the menus of most digital racing games. The all-new virtual instrumentation offers multiple layout possibilities, with up to eight different gauges displayed. There are 30 color options – 900 possible color combinations – and the screen can be personalized with different views for normal, snow, wet, sport, track and drag modes. If you don’t feel the exhaust note strikes the right pitch, choose a different setting. There are four of them: normal, sport, track and quiet. There’s also a configurable Quiet Start function that lets drivers schedule the time of day to turn down the volume of the 5.0L V-8 at ignition. No more guilt complex from having awakened the neighbors each morning as you fire up the car for the daily commute. On-the-fly changes to driving dynamics are made possible through a flick of a toggle switch on the center console, turning the car from a nasty dragster to a perfectly civil commuter. 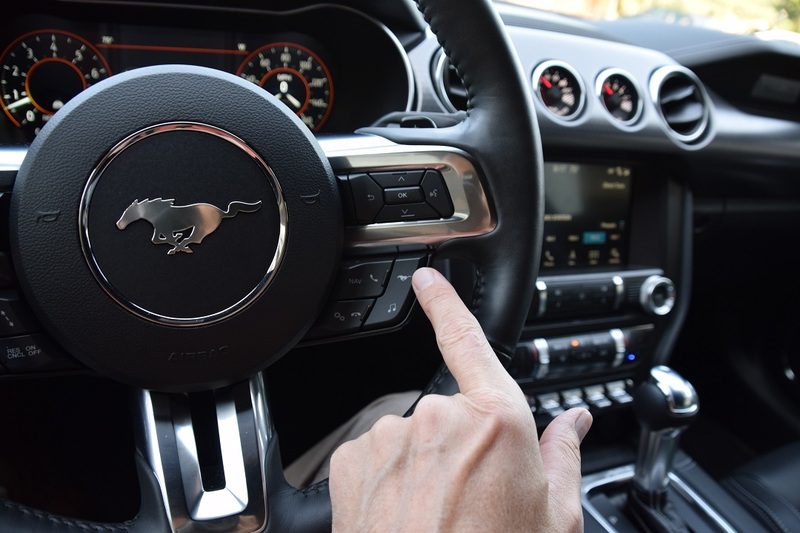 The “pony” button on the Mustang’s steering wheel provides access to multiple track apps that include an acceleration timer, brake performance readout, line-lock setting and lap timer. Line lock triggers an instrument-cluster animation of the rear wheels spinning and tire smoke rising – completely in sync with the car’s real rear wheels. The MyMode selection, new for ’18, allows drivers to save their favorite settings for the suspension, steering and exhaust note. Of course, the Mustang comes with Ford’s excellent Sync connectivity platform, which offers a number of apps, including Apple CarPlay and Android Auto. They are accessed through an 8-in. (20.3-cm) touchscreen, generously sized for a car of this class. The screen graphics are uncluttered and crisp, the system is fast and functions can be accessed with a high degree of accuracy via voice commands. “The voice control got everything right on the first attempt,” marvels one 10 Best UX judge. Our $51,470 GT tester also included navigation and Ford’s Safe & Smart package incorporating adaptive cruise control and blindspot warning with cross-traffic alert. But in the end, what’s really important is that fun factor. “I got more enjoyment from 30 minutes in the Mustang than from many UX candidates I had for an entire weekend,” sums up one Wards editor.